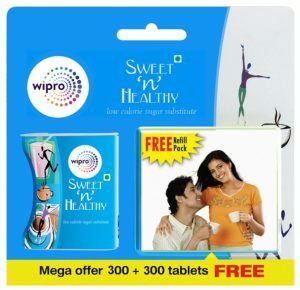 Amazon- Buy Wipro Sweet and Healthy Aspartame – 300+300 Tablets at Rs 127. Each tablet packs the sweetness of a spoonful of sugar, but only 2 percent of the calories. SO, Hurry up!!. How to buy Wipro Sweet and Healthy Aspartame – 300+300 Tablets at Rs 127 ?